Chemical Constituents and Components : Main chemical components are charantine, vicine, polypeptide-p, momordicinas 1, 2 and 3, a and b momorcrines, momordine, arginine, asparagines, aspartic acid, leucine, leusine, tyrosine and fixed oil. Bitters : 1. It shows hypoglycemic action. 2. It increases the glucose uptake and glycogen synthesis in liver, muscle and adipose tissue. 3. It shows reduction in glucose-6-phosphatase and fructose-1, 6-bisphosphatase activity, and increased glucose oxidation by G6PDH pathway. 4. It possesses cytotoxic activity against leukemic cells in vitro (guanylate cyclase inhibitor). Curing Diseases : 1. It enhances the body immune system to fight against infection. 2. 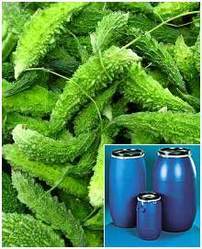 It is useful in diabetes, colic, cholera, sores and wounds. 3. It acts as antioxidant, antibacterial, anthelmintic, digestive, emetic and purgative. 4. It is also useful in gout and rheumatism. 5. It is helpful in piles, blood disorders and respiratory disorders. Possible Combinations : Momordica charantia + gymnema sylvestre + pterocarpus marsupium + syzygium cumini + glycyrrhiza glabra + swertia chirata + tinospora cordifolia + tribulus terrestris (very good hypoglycemic).